Two children journey a great distance to celebrate a birthday but came away with a gift of their own. 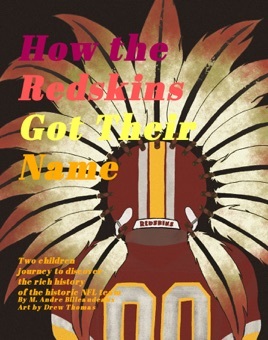 Through thoughtful discussions, bold illustrations and first-hand accounts, the kids gain a life-long lesson, as well as an answer, to the burning question about the appropriateness of their favorite team's name the Redskins. The story centers on a city where the exotic lore of Redskin Warriors intersected with the chance formation of an 'available' NFL franchise team all led by a colorful, Native-American-raised coach, who hired native football players. This amazing confluence of events occurred during a rare Native American renaissance, a period of heightened public recognition and improved independence - not seen before nor since. The fascinating story evokes contributing naming elements from our nation's patriotic fight for independence. Rich and inspiring, the tale highlights often-forgotten truths which some NFL fans, journalists or even Native Americans might not know. From their sage 99-year-old Great Grandfather and their new Native American friend, the 10-and 13-year old learn that the Redskins name is sometimes misunderstood by those unaware of the diverse evolutionary story of Native American warriors. These people, they reason, may not appreciate the rich ethos or educational value the name embodies. The two travelers come away from their first NFL game not only recognizing the positive legacy in honoring the venerable painted warriors in 1933, but the importance in treating the name today as an historic treasure. The Redskins, they know, is one the few surviving tribute symbols left standing in an American landscape once rich in Native American honorariums. As an avid researcher in to the usage of Native American names I can state this book is pure propaganda with very little in the sense of veracity.